I always hate it when I end up with a little leftover bread or a loaf that might be a little more dried out than I want. I’m never sure what to do with it, but as summer approaches, the answer is very clear. Make homemade croutons! Croutons can be a great addition to salads, soup, or used as chili toppers, stand-alone snacks, stuffing applications, and are a great serving method for roasted meats. You can make croutons out of your favorite bread, such as sourdough, french, whole wheat, ciabatta (and the list goes on). 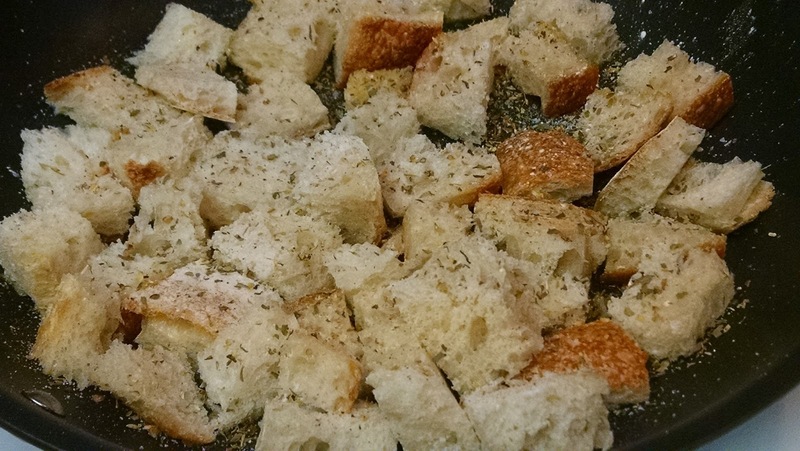 For this post, I will be using a sourdough loaf for our croutons recipe. Oh, why are we using a whole loaf instead of slices of bread you ask? Well, for a couple of reasons, but primarily because you can cut the croutons to the size of your choosing. Additionally, if you end up using sliced bread, those loaves are typically cut into thin slices, which means your croutons won’t have that beautiful shape and really stand out. If you don’t want to cut the bread yourself, you should be able to ask your bakery if they will slice the bread into squares for you. If you ask nicely, the bakery might hand cut some thicker slices for you too. Also, in my opinion larger-sized cube-shaped crouton are able to absorb seasonings easier and won’t become overcooked too quickly. Now, this isn’t to say you couldn’t use a simple style white bread, because you certainly could do so if that is your preference. However, go with what you like and what works for you because that’s what is most important when it comes to cooking. Okay, so what do we are we going to use to create these crispy, golden squares of goodness? Well, there are 3 components to a perfect crouton that you will always need. Those elements are oil (your choice), salt, and pepper, of course. After that, well, the world is your oyster (or crouton…), I think you get the idea. In other words, you can season these croutons with anything you want. 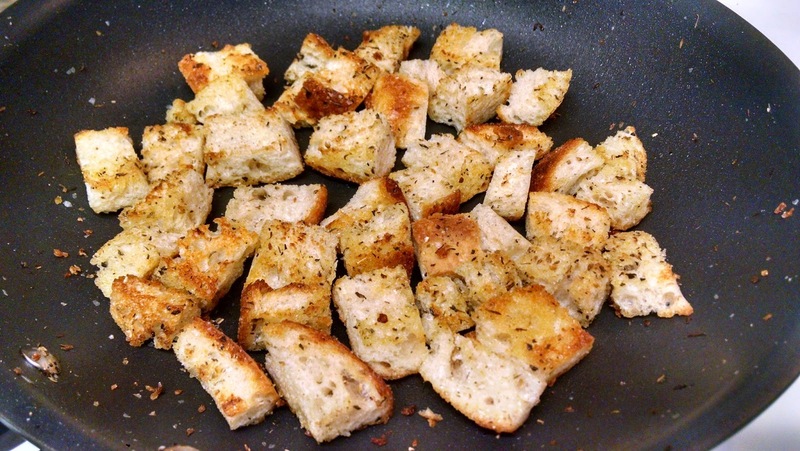 Typically croutons are seasoned with dried oregano, dried basil, and some garlic powder. However, if you like a little more heat or color, then I would say add a little chili powder or paprika respectively. Ready to make these? Me too! Let’s go! Fear not, it is only bread. Yes, this is a full loaf of Sourdough I am using. 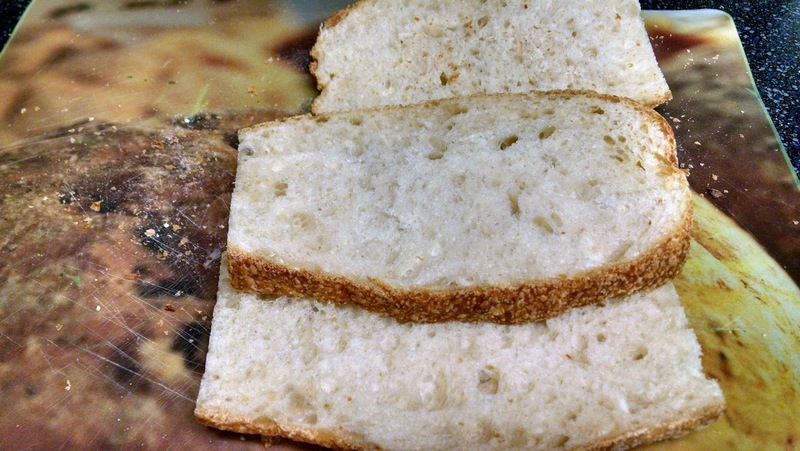 After you cut off the ends of the loaf, slice into 3 equal width sheets. Cut the sheets into strips and then cut into cubes. The croutons should look something like this. If you have some odd shaped pieces, don’t worry. You can cook them separately or just pull them a little earlier so they don’t get too crunchy or dark. Everything in the pan (shown above). As noted earlier, I stayed with the classic combination of olive oil, salt, pepper, dried oregano, dried basil, and a little garlic salt. After about 10-15 minutes of cooking on medium or medium-low heat you will end up with these beauties. Make no mistake, these are crispy, flavorful and crunchy at this point. The cubes don’t need to be totally dark and dried out in order to achieve that perfect texture like you might see at your local store. Stir these every few minutes, but give them a chance to get the color and texture you need. I suggest tasting often in order to gauge the seasoning and to make sure you are happy with the results. Some people prefer their croutons a little softer, while other prefer a little more crunch. When you are happy with the croutons, pull the pan off of the heat and let the croutons cool in the pan until you move the finished product to the assigned storage apparatus. Heat oil in a non stick skillet over medium heat. When oil starts to shimmer add cubed bread to pan. Add seasonings and toss to make sure the cubes are well coated. 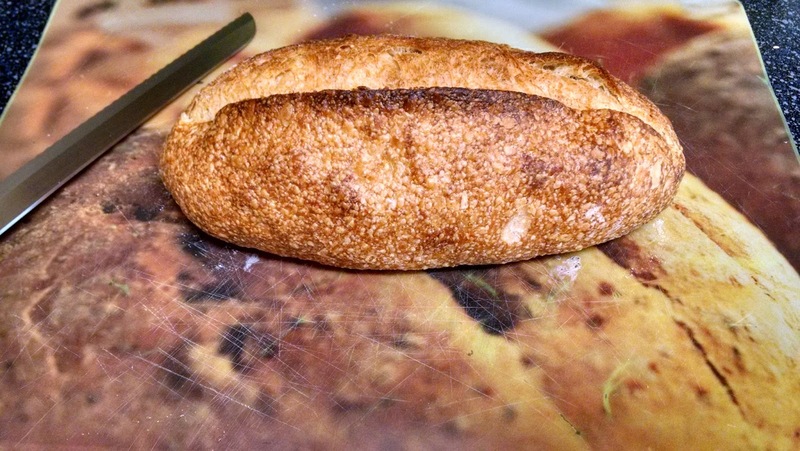 Allow bread to get golden brown on all sides and turn occasionally. When the croutons are cooled, store in an airtight container in your pantry for up to a week. Also, you can transfer the croutons to an airtight container or freezer safe bag and store for up to 6 months. Note that I have between 2-4 tablespoons of oil listed in the recipe. The cubes will absorb this oil, so add a little more oil as needed and it will help coax the beautiful golden color to the surface and it will also give the seasoning something to adhere as you make your croutons. In case you are wondering what this might look, well here you go! Oh, yeah, I do have some of my pickled onions in this salad along with my homemade balsamic vinaigrette. By the way, I forgot to mention the other great thing about this recipe is you get to control what is in your croutons. As you know, I am a big proponent of knowing what is in your food, and these croutons are no different. Next time you are at the grocery store glance at the ingredient list on the back of a bag of croutons. Now, count the ingredients, I will wait…………..done? No? So many of those ingredients aren’t necessary and only provide shelf-life stability. Very little of that list has anything to do with the flavor, I promise. So, take solace once again in knowing exactly what you are eating. Oh, yeah, if you have any croutons left over at the end of the week, you can use them to make breadcrumbs. Throw those croutons in a food processor or blender and pulse until you have your own homemade breadcrumbs. You now have opened the door to such things as shallow fried eggplant, or chicken or pork cutlets that are pounded thin and cooked in some oil till they are crisp. Just dip your vegetable or protein and saute till done. Don’t worry, we will cover all that too! I hope you enjoy finding ways to enjoy these amazing croutons. In addition, don’t be afraid to try some other seasoning combinations to make this recipe your own. 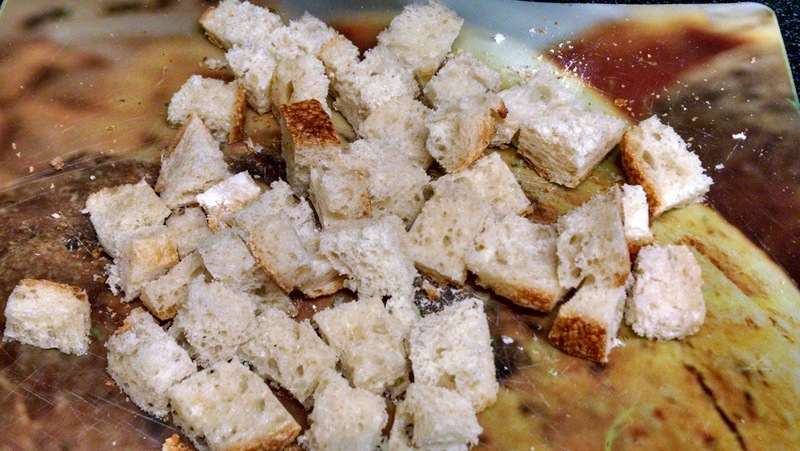 Croutons are great to have around and are so easy to make. Remember, have patience and as with so many of the other recipes you find on this site and you will be rewarded.